Nonya Laksa is a popular spicy curry noodle soup with endless variations. From the Pernanakan culture, which is the merger of Chinese and Malay culture found in Singapore. Typically made with thick rice noodles, the main ingredients for this coconut curry based soup are puffs of tofu, shrimp and cockles garnished with sambal chili paste and cilantro….yum! 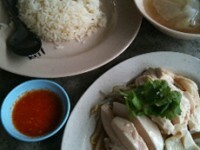 Hainan chicken rice is found at Hawker stalls everywhere in Singapore; this poached chicken dish originated from Hainan, and is served with fragrant rice cooked in concentrated chicken broth, ginger and garlic accompanied by a chili sauce, ginger puree and thick soy sauce and slices of cucumber. To toast the dried prawns, heat a dry pan over medium heat and stir-fry the prawns until they turn a shade darker, 3 to 5 minutes. Remove the prawns from the pan, let cool and blend in a mini-food processor to a coarse powder and set aside. With a blender or mini-food processor, grind together all the ingredients for the chili paste with 2 tablespoons of water to form a smooth paste. In a large sauce pan, heat 2 tablespoons of oil over high heat stir in the ground prawns and add the chili paste and saute until fragrant, 2 minutes. Add the coconut milk, water, fish sauce, lime juice and palm sugar and bring to a low boil for 2 minutes and then reduce the heat to low and simmer for 10 minutes. To cook the noodles and seafood, bring a large pot of water and 1 teaspoon of salt to a boil over high heat. Cook the noodles until they are just done, 2 to 3 minutes. Drain the noodles and divide them into warmed soup bowls. In the same pot, bring a quart of water to a boil. Reduce the heat to low and poach the prawns until they just turn opaque, 1 minute. Remove them with a slotted spoon to a large bowl. Add the fish cake to the same poaching liquid for 1 minute. Transfer them to the bowl of shrimp. Then add the mussels to the pot and cook until the shells just open, 2 to 3 minutes. Remove the mussels to the bowl of seafood and discard the poaching liquid. To serve the noodle soup, right before serving, add all the seafood to the simmering curry soup to heat through, 3 minutes. Use tongs to top each bowl of noodles with a variety of seafood and use a ladle to pour the hot coconut curry broth over the seafood. Generously top each bowl with the wedges of egg, beansprouts, cucumber, green onions, cilantro and a 1/2 teaspoon dollop of sambal chili paste. Serve immediately. To make the chili sauce, place the chilis, tomato paste, garlic, vinegar and sugar in a blender and process until a smooth paste forms. Heat a small skillet over medium-high heat, add 2 tablespoons of oil and fry the chili paste until it begins to thicken, about 3 minutes. Transfer the chili sauce to a small bowl. To serve, carefully remove the chicken from the poaching liquid and let rest for 10 minutes. With a pair of poultry shears, cut the chicken into pieces with the bone. Transfer the chicken to a warm platter and garnish with fried shallots and cucumber slices. 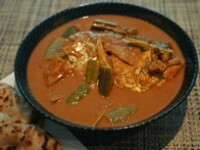 Serve with the warm rice and chili paste. Clean the crabs by removing the carapace. Pull away and discard the spongy gills and cut the body in half and then cut the halves in 4 pieces with the legs attached to the body. Crack the claws with a mallet, rinse the pieces of crab and pat very dry. To make the chili paste, use a mortar and pestle or mini-food processor to grind the chili paste ingredients into a thick paste. To make the seasoning sauce, in a small bowl combine the water with tomato paste, soy sauce and sugar. Heat a wok or large saute pan over high heat. Once the pan is very hot, coat the crab pieces in corn starch and shake off the excess. Add 3 tablespoons of oil to the pan and stir-fry the crab until the shell begins to turn orange and brown on the edges, 5 to 7 minutes. Transfer the crab to a bowl and reheat the same wok over high heat. When the pan is hot, add 1 tablespoon of oil to the pan and stir in the chili paste sauteing until fragrant, several seconds. 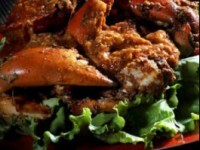 Quickly return the crab to the wok and toss well with the chili paste until the crab is well coated. Pour the seasoning sauce over the crab and continue to stir-fry until the sauce thickens and the crab is cooked through, 4 to 5 minutes. Stir in the fresh cilantro and transfer the crab to a warmed platter. Serve right away.